Better get this month's Washingtonian, y'all. I've only gotten to read one paragraph so far, but the rest is probably good, too. 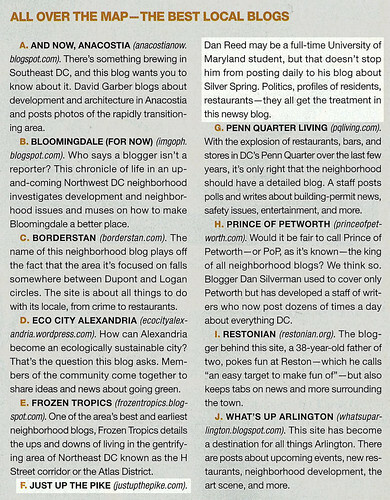 I was excited to see some of the D.C. blogs I regularly read, including Greater Greater Washington, Frozen Tropics and And Now, Anacostia, featured in an article about the best local bloggers. Note that you cannot get it online. Kinda bummed that, of all the neighborhood-based blogs they show, mine is the only one from Maryland, let alone from Silver Spring. Are the days of "Blogger SprUng" over? I don't think that myself or anyone can imagine the hard work that you do here. Dan Reed and Just Up the Pike Make Silver Spring a better place to live. This is awesome - I'll save my copy for you! You do definitely have the time and place announcements for almost everything that matters! I've often wondered where you get all of that information. I just moved to Silver Spring, and I found your blog through the article. Thanks, Sara! And welcome! I hope you stick around.